Some quite nice percussion effects from Marcello Magliocchi on Music For Sounding Sculptures In Twenty-Three Movements (ULTRAMARINE RECORDS UM011). He’s playing metal sound sculptures created by Andrea Dami. There aren’t any pictures supplied with this cassette release, but I found a good photostream on Flickr. The sculptures are boxes or cylinders of steel, the latter perhaps converted from oil drums; one of them is a little tree of cymbals using what looks like a large metal sieve for a plinth. One of them is even more elaborate, incorporating what looks like a large metal lute into its design, while another allows a mobile of smaller percussive objects to be dangled above it. As can be seen, Marcello uses sticks, mallets and bows to draw forth the range of sounds on these “instant compositions”. There are some rich and solemn sounds here, but the performances are rather static and lacklustre for me; it feels like an aural tour around the sculptor’s workshop, rather than a musical improvisatory set. What Eddie Prevost couldn’t have done with these sculptures, eh? 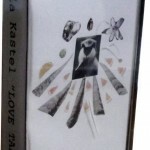 Silvia Kastel with her Love Tape (ULTRAMARINE RECORDS UM010) is from the same Italian cadre and has connections to the guitarist Ninni Morgia. This is quite a short tape with just seven tracks, and it’s a little gem of snappy experimental tapework. The main component is her own manipulated voice, mostly run backwards, cut to pieces, and played at odd speeds, and she sings, moans and murmurs in a strangulated fashion the better to convey her fractured visions. But there are other odd sounds in here too. Such music we hear is minimal, fragile and half-completed phrases simply looped into a basic pattern, be it a skeletal synth melody or awkward drumbeats. I get the feeling she has assembled this work with tremendous economy and intuition, allowing the complexity and interest to bubble forth naturally from the juxtapositions of a few simple elements. I would like to think of Love Tape as a form of inverted pop music as done by a fine artist, always a reliable sub-genre of experimental music. 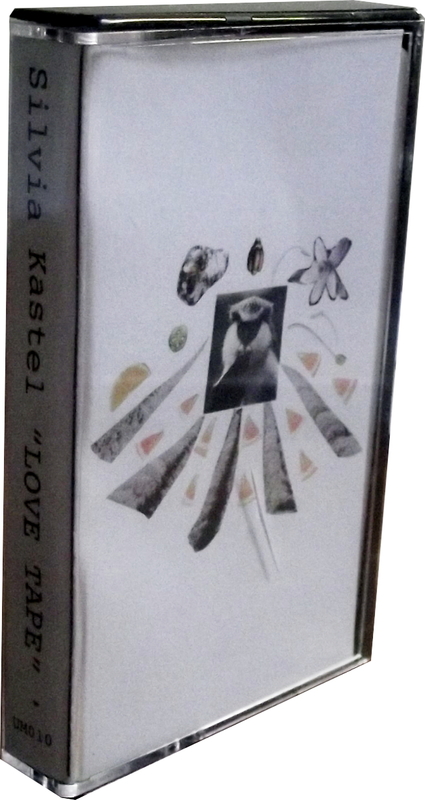 Kastel’s titles could almost be out-takes from an old 1980 session by Bow Wow Wow. At that point the analogy collapses though, because Love Tape is a disaffected and troubled vision of modern love, an arena fraught with doubts and uncertainties, where once-whole people are reduced to incoherent and mumbly ghosts of their former selves. Fine item! Sorry to have left it languishing in the bag since September 2011. Have you ever heard of a bat detector? The UK’s Bat Conservation Trust knows all about them, luckily, and it turns out there are a wide variety of these electronic devices which can allow us to hear the ultrasonic sounds made by these little black-coated gentlemen with their lovely leathery wings. The devices work in many ways to make audible that which is normally inaudible, including time expansion (slowing down the original bat sound) and frequency division (dividing the frequency rate of the sound); but all of them use the principle of heterodyning, that is mixing the original bat frequency with another frequency, and (through some clever method of sums and differences) presenting a sound that is within the range of the human ear. Every home should have a bat detector, even if you don’t have bats in your garden nor anticipate encountering any in the park. Eisuke Yanagisawa (film-maker, researcher and field recordist) has used one to make the record Ultrasonic Scapes (GRUENREKORDER Gr081). He started off with bats right enough, but soon applied it to cicadas, and thence to all sorts of electrical devices found in the street – including automatic gates, street lights, TV sets…in fine, just about anything that emits ultrasonic frequencies. Some of these sounds he blurts back at us are really intense and surprising, like particularly harsh forms of digital noise music, and even when not so intense they have a very compelling presence. Given its rather serendipitous nature and general lack of structure, you could never mistake this for electronic music, but on a purely aural level I can sense it would appeal to anyone who enjoyed what Stockhausen did with the ring modulator in the 1960s and 1970s. It’s also a rather process-based approach of course, and sometimes it seems more like a demo CD for a bat detector. While I personally would have liked to hear more utterances from the bats and the insects, the street noises are quite impressive too. A good listen – fascinating material which reveals an unheard world that is all around us, yet largely unknown.